In its second season, FX’s 1980s Southern California drug epic Snowfall figures out how to combine its parallel but once barely intersecting story lines into a coherent and compelling tale of crack distributors, CIA agents, and contractors getting pulled into what would ultimately become the Iran–Contra scandal. The result is sharp enough that newcomers can jump right into the series, starting with Wednesday’s season-two premiere, without having seen a frame of what came before it. If you are a Snowfall newcomer, you can deduce the essence of the major relationships by watching the characters go about their business and talk (or lie) to each other; for the most part, what’s onscreen is so confident that it makes the preceding season feel like a lot of throat-clearing. This series from John Singleton, Eric Amadio, and Dave Andron is still more good than great — there’s still a bit too much reliance on gunplay, intimidation ,and macho dares, and not enough on the personalities and specific practices of the drug trade, which is when the series really starts to cook, pun intended — but this has to be counted as a major improvement in a year that’s already given us plenty of examples of noticeable sophomore-year creative growth, from Atlanta and Dear White People to GLOW and The Good Fight. The main cast is headed by Franklin Saint (Damson Idris), a South Central Los Angeles drug dealer who’s making a play for the big time with help from an Israeli crime kingpin named Avi Drexer (Alon Aboutboul) and the muscle of his loyal family (including his Uncle Jerome, played by Amin Joseph, and his Aunt Louie, played by Angela Lewis). Franklin is the most fascinating character by far, thanks to Idris’s alert, reactive performance and the writing, which positions Franklin as a hyperintelligent gangster in the vein of Michael Corleone, young Vito Corleone, and Gabriel Byrne’s consigliere in Miller’s Crossing, all of whom knew more than they let on and kept their cards close to their vests as they plotted their next moves. Less mesmerizing but still fascinating are CIA agent Teddy McDonald (Carter Hudson) and Lucia Villanueva (Emily Rios, formerly of Breaking Bad) and her lover and loyal right hand Gustavo Zapata (Sergio Peris-Mencheta); the first season’s momentum flagged a bit whenever it switched over to their stories, a problem that often affects series with large ensembles of characters who exist in somewhat self-contained narrative spaces. 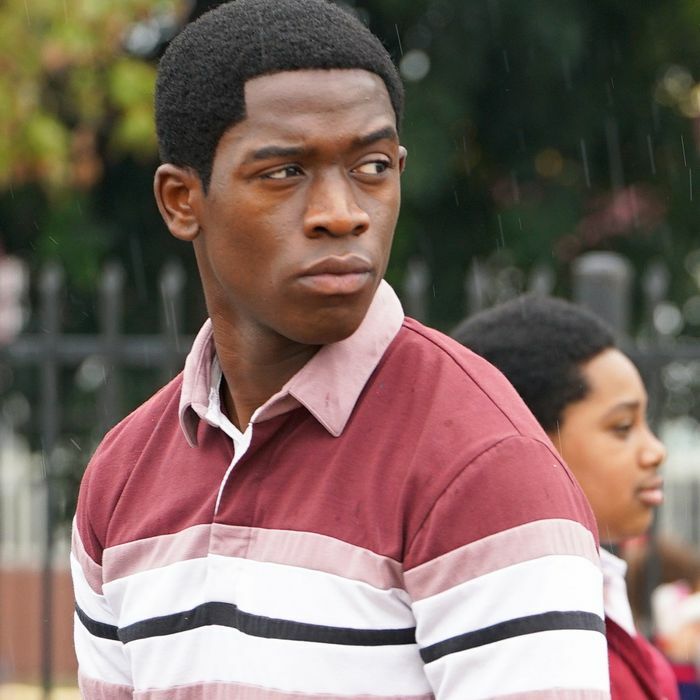 Snowfall seems to have figured out how to eliminate or at least minimize that problem this time out — no fair telling you how, as it takes a couple of hours to maneuver the key pieces into place — and the series is more exciting as a result. The season-two premiere, “Sightlines,” written by Andron and directed by The Americans veteran Dan Attias, has a pleasing snap to it, getting in and out of situations with little wasted motion, making good use of period deep cuts (including a cover of “California Dreaming”) and ending on a cliffhanger that’s just shy of seeming wry. But the series’ major failing is still its reluctance to lean hard into the bleak humor that ought to come naturally, given its subject matter. There’s no reason why Snowfall couldn’t ratchet back the tension and explosions of rote violence to indulge more absurdity, considering that the real stories behind the scripts are often so ridiculous that they make such black comedies as Dr. Strangelove, Catch-22, and the remake of Scarface (name-checked here; “Everybody in that mufucka die,” a character says in awe) seem like models of sobriety. But in time, the season develops its own particular vibe, thanks to a pervasive sense of the time and place (crime-fiction legend Walter Mosley is on the writing staff this year) and the actors’ ability to flesh out their characters with recognizably human details (such as Jerome’s pigeon-toed walk, and the way Franklin makes brief eye contact with every person in a room as he enters it). A brief scene of Teddy and Matt playing pool includes a discussion of the difference between coincidence and irony, a distinction that grows increasingly important as the stories unfold. Mosley’s script for the third episode, “Prometheus Rising,” is a thing of beauty, rooting an elaborate series of confrontations and double-crosses in settings so anthropologically exact that you can practically smell the honeysuckle, the oil-stained pavement, and the boozy sweat leaking through men’s pores. At its worst, this is a still-not-quite-there prestige drama, but at its best and most interesting, it plays like a very solid 1980s B movie, the kind that young filmmakers and critics would have discovered two decades after it came and went, then scrambled to remake.